Steve was diagnosed with CMT syndrome, complicated by Osteomyelitis, in 2005 when doctors were forced to amputate his left leg below the knee. Hefty insurance co-pays prohibited Steve from a much needed replacement prosthesis as parts began to deteriorate and the fit was less than adequate on the one he was wearing. 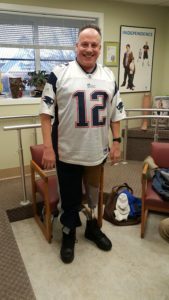 Now Steve is walking tall and easier with a brand new, proper fitting below knee prosthesis, courtesy of HAF!